A bear has lost his pointy red hat. He wanders morosely from page to page asking other animals if they have seen it. In his sorrow, he fails to notice that a rabbit happens to be wearing a pointy red hat. After lying on the ground for a while he has a revelation; he DOES know who has taken his hat! The bear runs backwards through the book, and indeed gets his hat back. It’s a happy ending for the bear and the hat. The reader is left to surmise what has happened to the rabbit. Klassen not only breaks ‘the rules’ of what it takes to create a picture book for modern audiences; he seems to be starting a trend. What are the unwritten non-existent rules of picture books? Bright colours (because it’s thought kids only respond to bright colours), happy-lively characterisation (not morose); protagonists who do the right thing despite everything. I Want My Hat Back is almost a spoof on a large category of picturebooks which anthropomorphise bears and other wild animals to the point where they are borderline vegetarian. When we see picturebook bears eat, they tend to be eating human food from plates, using knives and forks. Picturebook bears do not go hunting. Adult co-readers know this, and I’m sure young readers know this deep down, but perhaps talking picturebook bears who happen to eat talking rabbit is taboo. This book is written in such a way that should the book be read to a 3 year old who can’t yet cope with the reality of the food chain, that 3 year old can imagine instead that the rabbit delivered the hat back to the bear then ran away safely. But there is no such reassurance in the text. Klassen works with inks, gouache and acrylics but everything is altered digitally afterwards. I wonder how few illustrators are completely avoiding the computer these days. Interestingly, Shaun Tan does the inverse, sorting out his composition on the computer then using that as a model to paint on canvas. One thing that makes Klassen’s work distinctive is his texturing; he apparently creates the textures with paint, scans them in and keeps them in an unorganised folder on his computer. This makes me feel better about the general disorganisation of my own computer. I do a lot of random texture samples on pieces of paper that will only find their homes once they’ve been scanned into the computer, and there’s no way to organize stuff like that once you’ve scanned it, so they are just everywhere around. Textured overlays can make a big difference to an illustration, but tend to be one of those subtle additions that goes unnoticed by the reader of the story. Klassen’s are kind of ‘waterstained’ and ‘splattery’. This gives a sense of movement to images which otherwise look a little like collage, which is a more static-feeling medium. Although the characters are different, this is very much the ‘on-land’ companion book to Klassen’s subsequent This Is Not My Hat. Sometimes when best-selling authors create a second book in similar style, the second one isn’t such a success. But both of these books are equally wonderful; buy both. Contrast with The Tawny Scrawny Lion (A Golden Book), in which a lion is much happier after turning pescatarian. The following year, Jon Klassen published This Is Not My Hat, which seems to be set in the same world as this book, but stars different characters. This is an interesting choice, because I suspect authors are often encouraged to create series based on the same character so that children will fall deeply in love with them and ask their parents to buy the plush toys. A fun diversion is rewriting the titles of the picture books on your shelf. When you do this, you may be surprised to see that picture books have their own genre classifications. 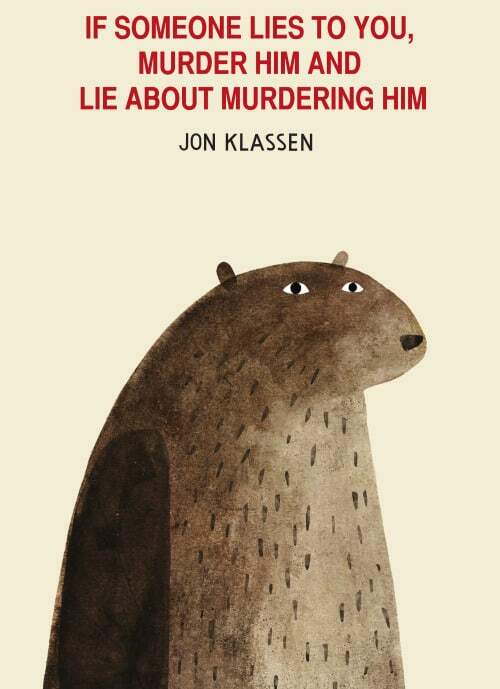 Jon Klassen seems to have (re? )invented the picturebook crime genre. I Want My Hat Back, Don’t Ask Me Anymore Questions from We Read It Like This.